Just a couple finishing touches to go, but the Big Stuff is done: Floor, paint, lighting, faux deer-head decor, and now the curtain and work surface. 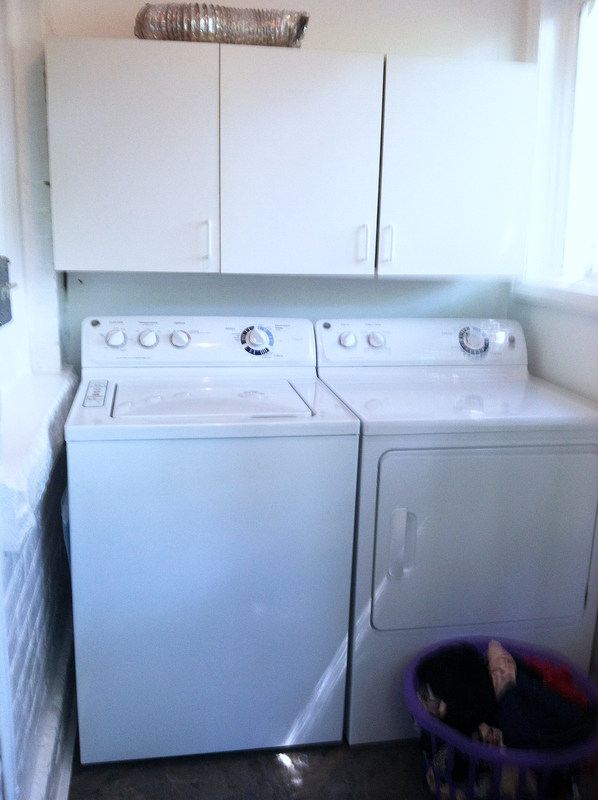 Because the laundry room is also the back porch and pass-through to the backyard and garage, I want it to be pretty. I don’t want to see the machines and be reminded of dirty laundry every time I walk though, so I decided to cover up the washer and dryer. 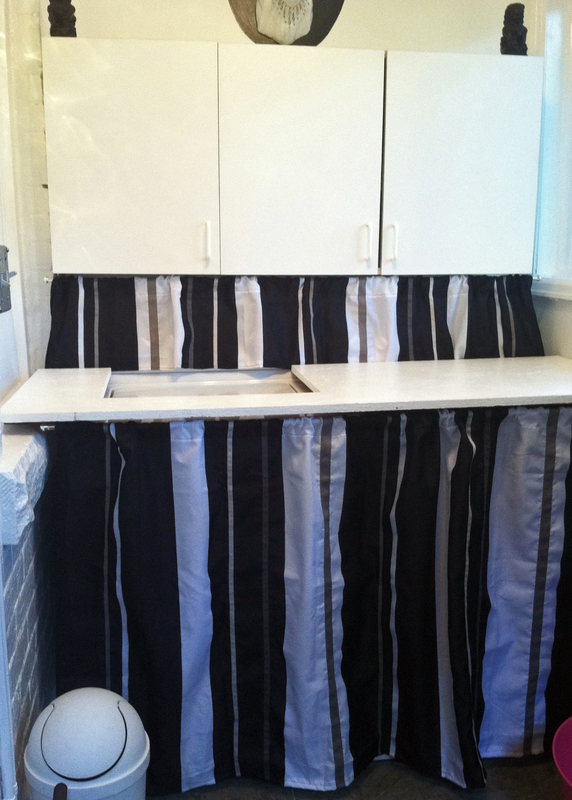 (we also like to use this area as a DIY bar for parties) This cover-up was easy-peasy. I simply added a slab of wood for a work surface/shelf, and curtains under the cabinets and shelf. BEFORE: Machines all hanging out in the open. For the curtains, I used an old shower curtain that was the victim of an unfortunate hair-dye accident in the bathroom last year. 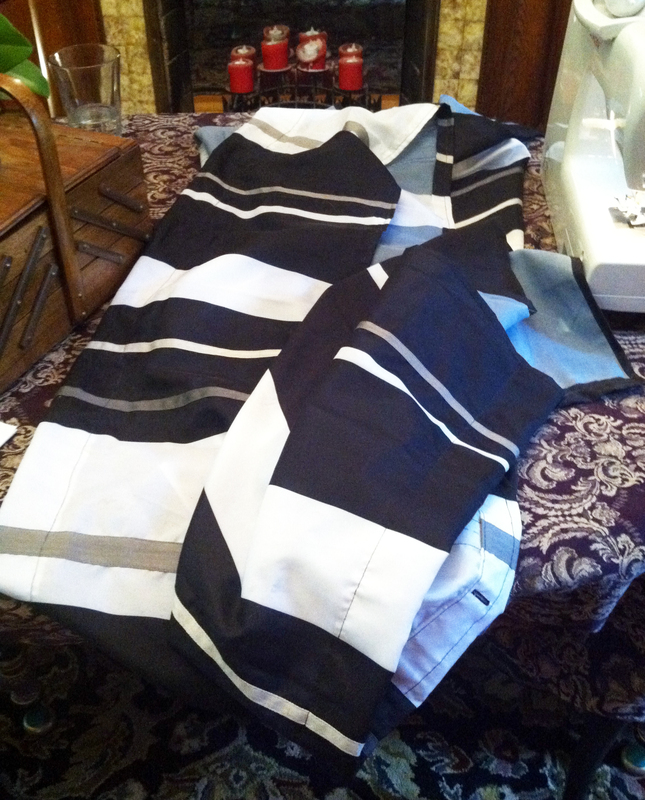 (A shower curtain is ideal here as it can get wet with no ill effects) The dye stain was in the center of the curtain, so I was able to cut out the 2 smaller curtains around it and salvage the thing. It’s the perfect look for my little hipster black and white laundry room. 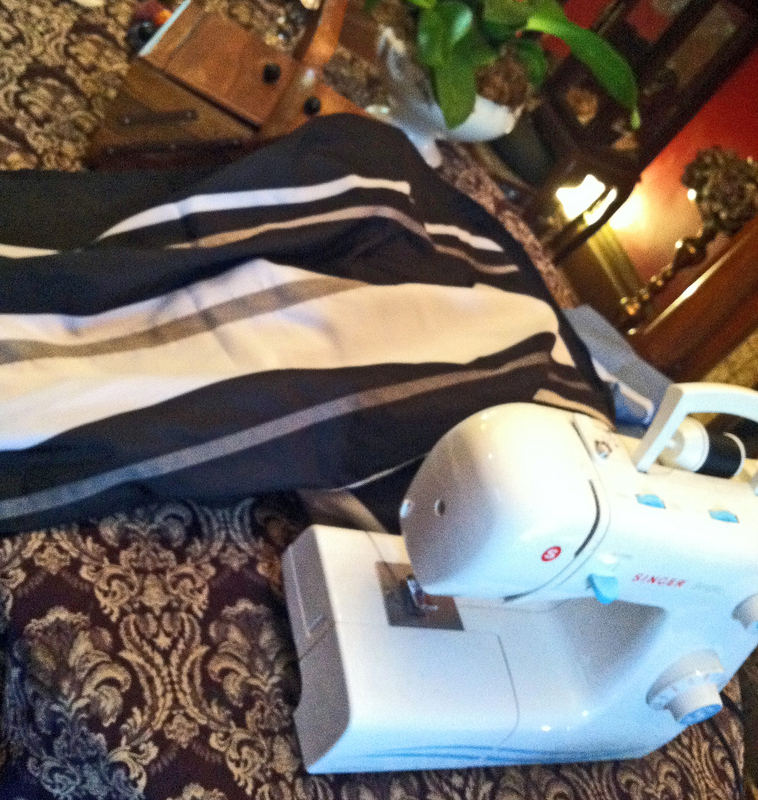 I measured the 2 spaces, cut the shower curtain to size, and did a simple straight-line sewing job, being sure to loop over the tops so the curtains would fit over the simple curtain rods I picked up at Home Depot for $8 each. For the shelf I used a piece of particle board leftover from the backyard gazebo seating I made a few years ago. 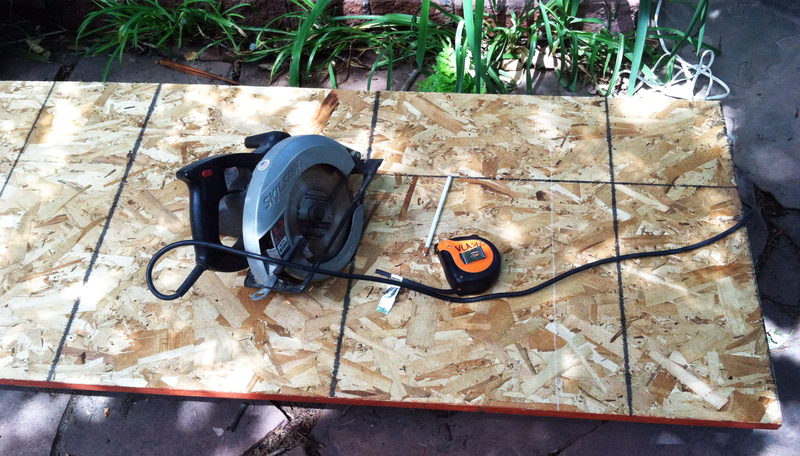 I measured the space it was to fit into and cut off the end with a circular saw. 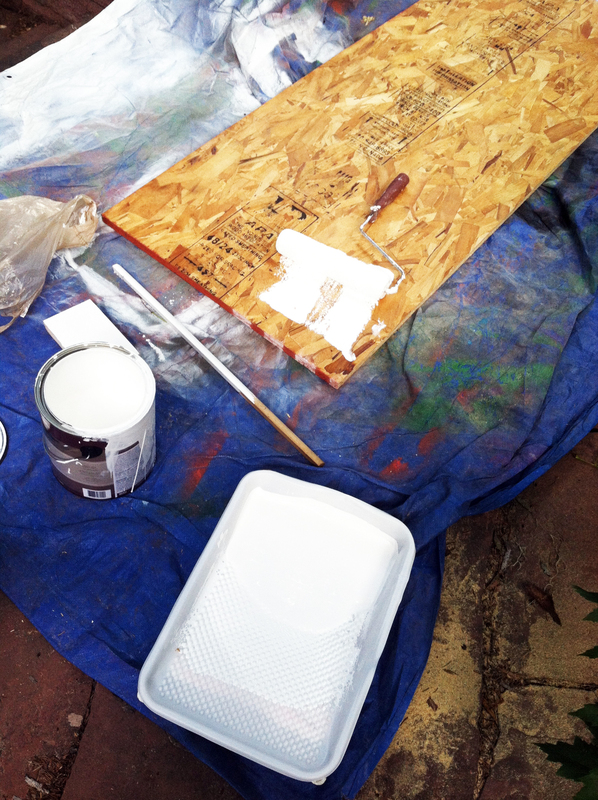 Then, using white paint leftover from the laundry room walls, I rolled on 3 coats. I’ll be honest, particle board was not my first choice, but heck, it was there, it was free, and in the end it worked out just fine. 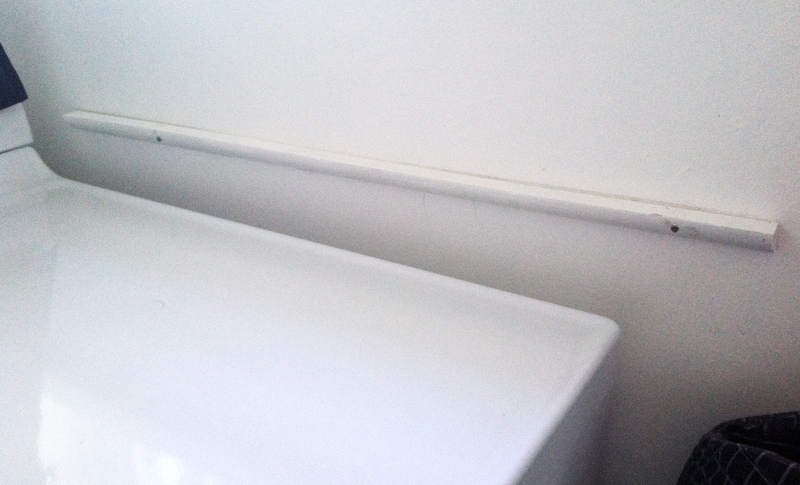 The other side of the shelf has a window sill, but it wasn’t high enough to support the shelf. 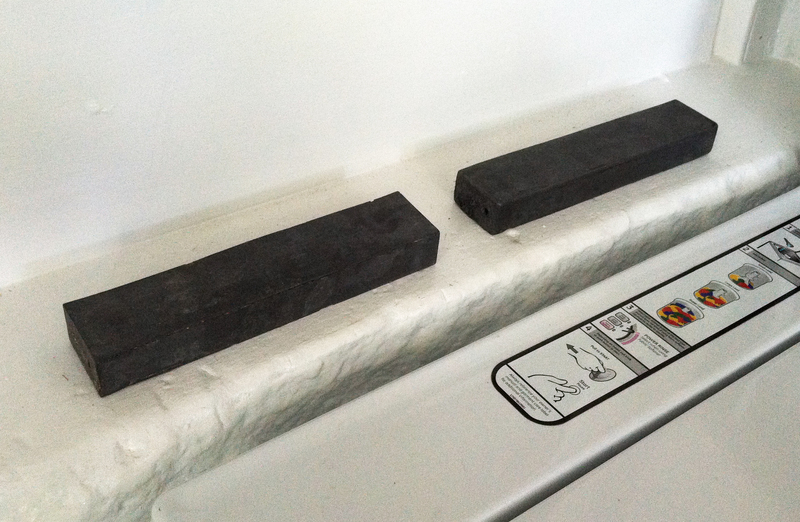 I found these 1″ thick pieces of metal laying around, and placed them under the shelf. Worked great. I secured them in place with a little hot glue. I was so excited to get the shelf done, I made one big-ol’ boo boo. Can you guess what it is? Yup, I forgot to cut out for the washer lid. Sigh. This should have been done BEFORE painting. 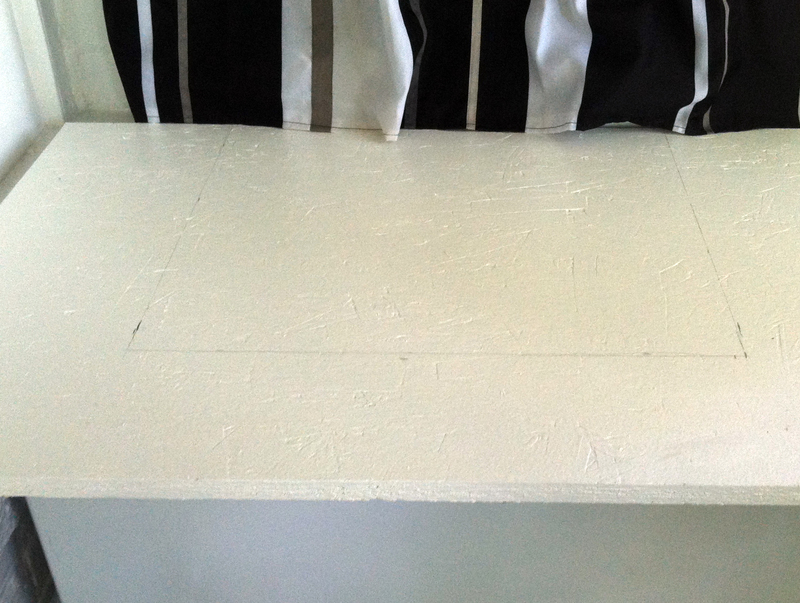 I measured for the hole, cut it out with the circular saw, and sanded and painted the raw edges. Once that part was finished, I screwed large cup hooks under the cabinets and under the shelf to hold the skinny curtain rods, and put up the curtains. Done! Because I used leftover bits from other projects, the only cost on this one was the 2 curtain rods and the large cup hooks, which ran about $20 total. I know the photo above is all reflect-y, I had to take the picture through the window from outside to get it all in. It’s a tiny room! Now all that’s left is adding a piece of trim to the edge of the new shelf and finding a small appropriate rug. More pics to come when it’s all in place. 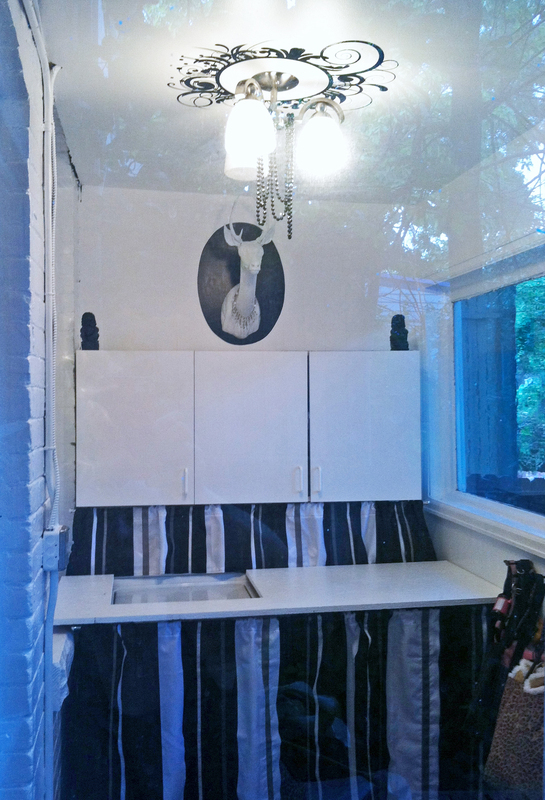 This entry was posted in decorating, DIY, home, Uncategorized and tagged back porch, best for less, budget, decor, decorating, DIY, fine living, hipster laundry room, laundry room, laundry room curtains, laundry room make-over, laundry room re-do, redecorating, redo, restyle, saving, washer dryer cover-up. Bookmark the permalink.